I was granted the gift of a decent ability to remember things. My capacity for recall has served me well enough; through years of English Lit exams, countless passwords and PINs, phone numbers and postal codes, and all the other scraps of information deemed vital these days. For the longest time, I had my brother's Social Insurance Number memorized. I was without specific reason to do so, I just did. Mysterious how the mind works. Doubly mysterious how it sometimes chooses to abandon you completely. In my case? That memory of mine has one specific failing, and a funny one at that. Pakoras. It's not that I've forgotten them, that would be impossible. Those vegetable fritters were one of the reasons that ours was the most popular house for after-school snacks on our street. My grandmother and mother made them with onions or with sliced potatoes most often, sometimes with cauliflower too. Crisp and tender, touched by spice, they were like onion rings and potato chips and french fries all rolled together, made that much better by the combination. My preferred pakoras were onion ones. They would emerge from the oil open-weaved, with rings of onion coiling around each other. In those few spots where the batter collected, the pakora was soft and fluffy; where the batter was thin, it shattered with a delicate crunch. Trouble is that Grandma, the maker of superlative pakoras, firmly disavows these lacy versions of my childhood memory as her intended result. For a split second I foolhardily considered a defense of my recollection, but you don't argue with Grandma. Of course the mistake was mine. As I examined this lapse in my reminiscence, I had two epiphanies. First, my well-documented greed is probably at the root of this. I wouldn't be surprised if my childhood self (or my adult self for that matter) saw it fit to only select the thinnest, snappiest, pakoras of the bunch; only those ideal specimens would have been squirreled onto my plate. Second, I shouldn't expect myself to be a faithful narrator to this story. It is inherent to the nature of our most treasured childhood memories that they be viewed through the blurred lens of nostalgia. Of course it would be that in my recollection every pakora was my exact favourite. Lucky for me, pakoras are not only in my memory. And now that I'm the one at the stove, I can indulge my fancy and make sure that every pakora out of the oil is, in fact, my exact favourite kind. Yes, I know, greedy of me. Again. But I'll sit with spine straight and head high. To me, these are memory brought to life, or to our plates to be specific, with the bias of sentiment fully, marvelously intact. Pakoras are often made with a batter that includes a variety of spices and a leavening agent. This is my Grandmother's recipe, who believes that simplicity is best when appreciating the qualities of each ingredient. As I said, you don't want to contest her opinion; I'm smart enough to be a good little granddaughter and report it faithfully. Since I do deviate from tradition in the way they are shaped, I've called these fritters to avoid any confusion. 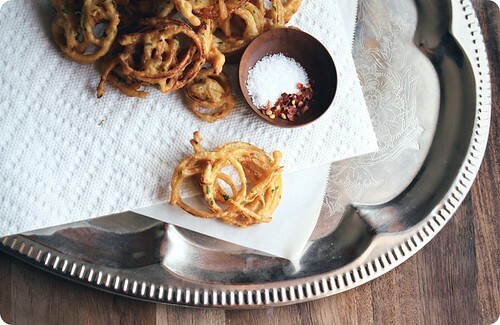 Ramshackle and rustic, the messier your clumps of onion, the more texture there will be in the finished fritter. For the full pakora experience of my childhood, the ketchup chili sauce combination is a must. In a medium bowl, stir together the flour, chili, cilantro and salt. Slowly stir in enough water until the mixture reaches the consistency of whipping (heavy) cream. Beat the batter well, so it is lightened and foamy at the edges. Set aside. In a heavy-bottomed pot on the stove or in a deep fryer, heat oil to 350°F (175°C). When that's reached temperature, separate the onion layers into individual rings and drop them into the batter, stirring gently to coat. 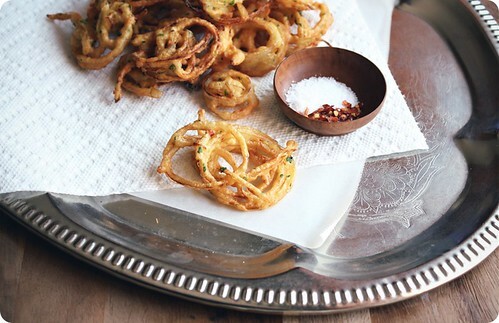 Using a fork, pick up a clump of onion rings and allow the excess batter to drip off. Carefully drop the tangle of onions into the oil and fry until lightly golden on one side, around 30-40 seconds. Flip the fritter and cook until crisp on the other side. Remove from the oil and drain on a cooling rack set up over newspaper or on some folded paper towels. Repeat, frying a few at a time, until all the onion and batter is used. Enjoy immediately, with additional salt sprinkled over and a squeeze of lime juice. Offer a condiment of ketchup blended with chili sauce for dipping. Serves 2-4, depending on appetite. To be safe, let's say 2. 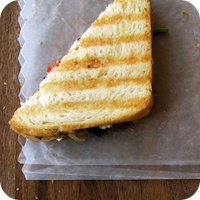 • A small amount of crushed dried red chili can be used in place of the fresh. • Pakoras can be made with a variety of vegetables. Melissa has some phenomenal versions to offer. I've stopped in with some chickpeas today, along with a recipe that has me acting like a crazy person. How so? Well, let's read the ingredients. You will surely recognize the usual suspects, robust olive oil, our old friend garlic, aromatic leeks and of course the chickpeas. Then there's twangy lemon and woodsy rosemary, adding height and depth to the mix. Last, the salt. Can't forget that, the universal leveler, the thing that amplifies individual flavours while miraculously creating overall harmony. Who have I become? It's unlike me to bring Salt along without it's bosom buddy Pepper. And often I go one step further, with dried chili flakes, cayenne or Kashmiri chili thrown in for kicks. But in this case, (deep breath) I have decided I don't want pepper anywhere near this meal. 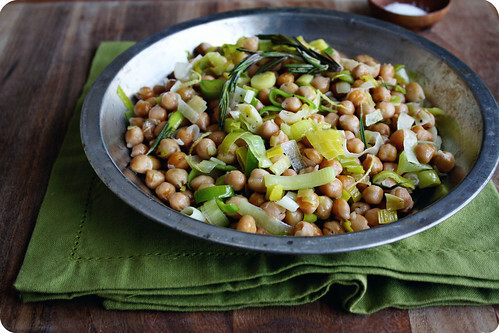 Let me give you some sense of this tumble of stewy leeks and chickpeas; they cook up in a way that is gratifyingly substantial, as is our need in these January days. But they are just cooked, without a trace of sludginess, still firm and springy-centered. Silken leeks curl around their goldeness, the pale jadeite strands are floral and sweet. The rosemary and lemon are noticed to be sure, but their forms are blurred at the edges, melting into and carrying forth the flavours of the others in equal measure. The full effect is something akin to what it would be like to read the collected poems of e.e. cummings by spoon rather than by eye. While there is a variation in tone from bite to bite, there are no full stops or pesky uppercase letters to interrupt the rhythm we've got going here. Pepper would break up that essential mellowness, its wham! bang! personality, although a virtue elsewhere, would be too much for the delicate structure of this dish to bear. We can't have that. So, I've banished the pepper. Scandalous behaviour, on my part. Secondly, I'm mad for this stuff. Straight out of the pan it is terribly good, with some wilted bitter greens or steamed broccoli rabe nearby to swirl into the herby, lemony, garlic-infused olive oil left behind. Or, pour in few glugs of stock (chicken or vegetable, please) and suddenly there's soup. It can be eaten as is, with perhaps some Parmesan, or blitzed into a purée (but take the rosemary sprigs out before bringing out the heavy machinery). Whatever way, in mine at least, hold the pepper. I was heavy-handed with the olive oil, as I knew I wanted that excess to dress the greens served alongside. 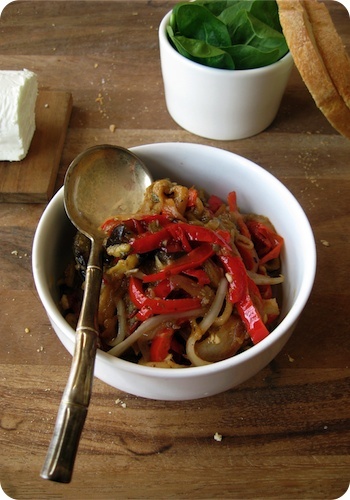 For a lighter dish, or if your intended result is soup, reduce the oil to 2 tablespoons. Adding the rosemary back to the pan at the end gives a final hit of herbal steam. The twig, and the clove of garlic, can be removed before serving if desired. In a large skillet, heat the olive oil, garlic and rosemary over medium heat. Once the garlic turns fragrant and the rosemary begins to sizzle, remove the rosemary but reserve for later. Add the leeks to the pan, along with a good pinch of salt. Cook, stirring often, until the leeks are soft and sweet but still brightly green, around 5 minutes. Tip in the chickpeas, and continue to cook for a 5 minutes more, at which point the chickpeas should have darkened slightly in colour. Using a microplane or zester, add a few scrapes of lemon zest to the pan, along with a squeeze of lemon juice. Stir gently to combine. Check for seasoning, adding more juice, zest or salt as needed. Return the reserved rosemary sprigs to the pan, and enjoy warm or at room temperature. 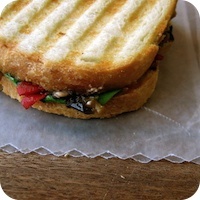 I know that I am more than late for our usual Thursday chat, but please forgive my tardiness. Due to an oversight on my part, our guest of honour was not ready for their debut. But finally, the wait is over. The pickles have arrived. And what pickles they are. But before I tell you about their end, let me tell you of how they came to be. At the market last weekend, I overheard a farmer describing the progress of his crop. Speaking in glowing tones that were more than tinged with pride, he detailed the specific traits of each of his vegetables; how they grew, their likes and dislikes, their particular qualities. He had a quiet intensity about the way he spoke, an enthusiasm that shone through his words. It was evident that the subject matter was of the utmost importance - more than a livelihood, but a passion as well. There's just one of the many reasons why he's our Regular Vegetable Man. On that same weekend his summer squash was especially fine, slender and small, with delicate, taut skin that was perfectly blemish-free. 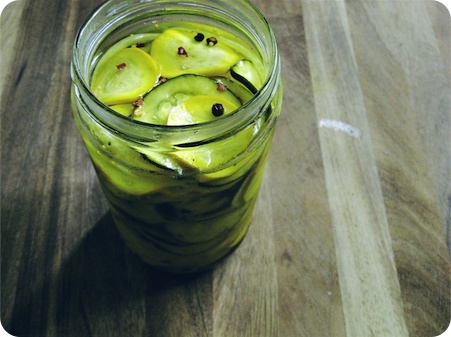 I do not know what it was that sparked my idea of pickling these little darlings, but a pickle was my particular plan. It was a surprising choice, as my usual tendency is to grill, griddle, or roast. But a pickle seemed the order of the day, the promise of crisp, cold slices of squash, puckery and astringent had me salivating. As a good pickle should. Five days after salting, boiling and sealing the jars tight, I opened the fridge with fork in hand and anticipation in my heart. That's the thing about pickles, they require faith. Commitment. They take their own sweet time. You do what you can to set things in motion, but that is where your influence ends. What you put in the jar is as acrid and overblown, eye-twitchingly sour. But wait, just you wait, this is only the beginning. From there, the pickle really takes care of itself. The wait is transformative, and what happens inside that glass coccoon is entirely out of your hands. But your patience will be duly rewarded. And rewarded I was. After those days, the vinegars had mellowed and muted, now balanced with a sweetness that is first to the tongue. The heat follows, with the indisputable zing of acid to finish. I wonder if our Vegetable Man might like a jar. Inspired by a recipe from Simply Recipes. As these are meant as a refrigerator (chilled) pickle, they are not processed after being canned. Please see the link above for valuable tips on sterilizing and, if you so choose, how to process pickles so that they are shelf-stable. Toss squash and onion with salt in a large colander set over a bowl. Add ice, toss again. Refrigerate, tossing occasionally for 3 hours. This process will increase the crunch of the pickles by drawing out excess water. Once the 3 hours have passed, drain the squash, picking out any ice cubes that might remain. Rinse well and drain again. Bring vinegars, sugar, mustard and celery seeds, peppercorns, turmeric, red pepper flakes and ground clove to a boil in a saucepan. Add the drained squash and onion. Ladle into 4 hot sterilized pint jars, leaving about 1/2 inch below each jar's neck. Carefully wipe rims of jars with a clean, damp cloth. Cover tightly with new, sterilized lids and screw tops. Cool to room temperature, then store in the fridge for 3-5 days before opening. Makes 4 1-pint jars, to be eaten within weeks of making.